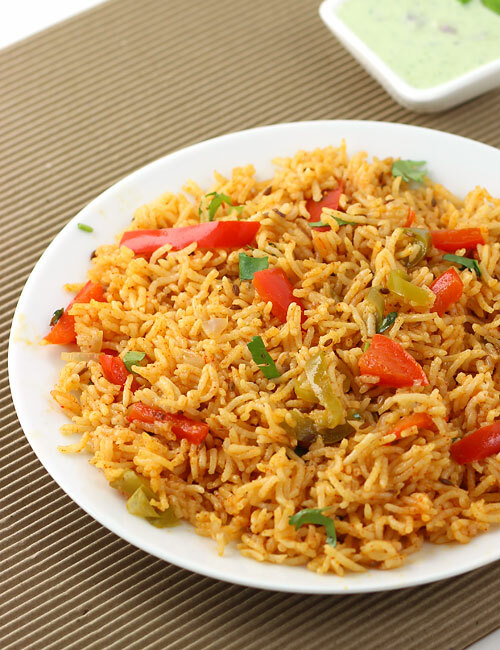 Capsicum Rice or Capsicum Pulao, a quick and easy to make spicy rice dish, is perfect way to bring a change to your routine rice dishes. 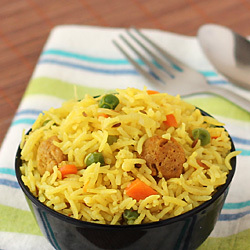 Unlike other Pulao Recipes, this recipe uses a approach of sautéing the soaked Basmati Rice with sliced capsicum, onion, curd and other basic spices and then steam cooking it in pressure cooker. This process results in deeply flavorful and aromatic rice. This Capsicum Rice Recipe uses a pressure cooker but you can also use a pan (with a lid) if you are more comfortable with that. Enjoy it with plain curd or any type of Raita and Chutney for lunch, dinner and even pack it in the lunchbox. Note: Nowadays, capsicum is available in different colors like green, red, yellow and orange. Each one tastes slightly different compared to other. You can either use only green capsicum or different colored capsicums according to the availability and your choice. 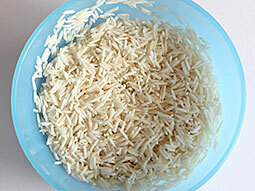 Wash the rice in water for 3-4 times and soak them in water for 20 minutes. 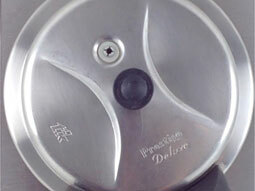 Take a 2-3 liter capacity pressure cooker or a pan with lid. Heat 1½ tablespoons oil over medium flame in it for sauteing the spices. Add 1-teaspoon cumin seeds and let them crackle. 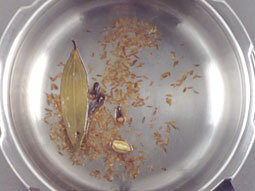 Add 2-cloves, 1-green cardamom, a small piece of cinnamon and a bay leaf. Sauté them for few seconds. 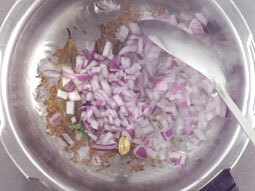 Add finely chopped onion and sauté until onion turns light pink. 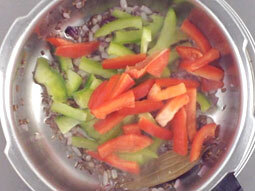 Add sliced capsicum and salt (adjust only for capsicums). We have used Red and Green capsicums in this recipe but you can use either only green capsicum or different colored capsicums according to your choice and availability. Mix well and sauté for 2-3 minutes. Add soaked rice and sauté for 2 minutes. 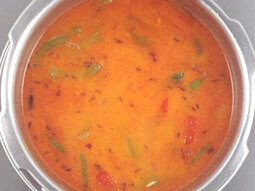 Add 1/4 cup plain curd, 1/2 teaspoon red chilli powder and 1-teaspoon coriander powder. Add 1 & 1/3 cup water and salt. Mix well. Turn off the flame. Let the pressure come down naturally. Open the lid and fluff the rice with a fork. 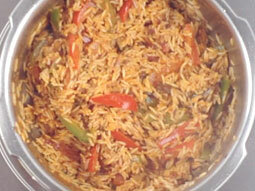 Capsicum rice is now ready for serving. Serve it with mint raita or plain curd and enjoy. 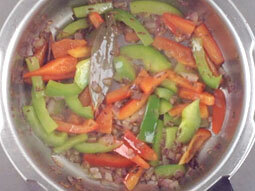 Use red, green, yellow, and orange capsicums to make it look tempting. You can make Capsicum Rice with leftover steamed rice too! 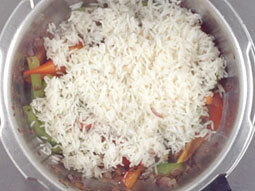 Follow steps 1 to 5, skip the step-6 and add cooked rice in step-7 and mix well. Add 1/4 cup frozen green peas or 1/4 cup sweet corn kernels in step-5 for variation. If you are making this for kid’s lunchbox, do not add red chilli powder in Step-7. 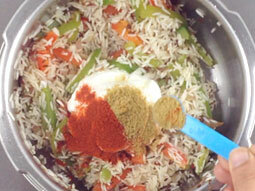 Serving Ideas: Serve capsicum rice with your choice of raita or plain curd in the dinner. It’s a perfect combo for lunchbox when served with mint raita. I just love your blog . I tried this today and it turned out really good .. My daughter really loved it . Am going to try many more recipes from your blog soon. Thank you. 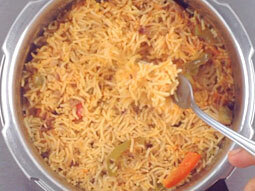 I tried it today, it turned out really delicious..thank you so much for sharing.. It was okay. I would reduce the quantity of cumin seeds. Sorry; probably won't make again.